Mini Modern: You Know What Would Be Cool? I am just now catching up on the last 2 episodes of Nip/Tuck. Is it me or is this season's storyline off to a slow start?? Ahh well, at least Burn Notice is still interesting. What's that got to do with modern dollhouses? Absolutely nothing, except as I was watching "the Nip/Tuck", I thought that if I had a modern dollhouse/toy company, I would try to secure the rights to make miniatures of the characters and places of that show. I think it would be so damn funny to have a little miniature plastic surgery office and operating room. Their diggs on the show have been pretty nice so that would also be cool in 1:12 scale. The possibilities are hilarious. I used to say the same thing about Deadwood and Carnivale. Actually, I am still surprised that there aren't any action figures based on those two shows. Geez do I miss those shows---all gone way too soon. There's a stop-motion animation movie coming out tomorrow called Coraline. I went to the Cartoon Art Museum in San Francisco today to look at the original works of art from the film. I was awed by the detail of the puppets and tiny costumes. The art inspires me. And, of course, I walked away chattering about how the two worlds in the film would make cool dollhouses and figures. Okay, random interesting things that I have seen in the mini world--First up, a new 1:6 Bodo Hennig kitchen that is begging to be bedazzled. Please note that when I say "bedazzled" that I don't mean the whole sparkly unicorn or pegasus business. I really think this kitchen piece could be supreme with some crafty hands. A stacked washer and dryer for that small space, modern apartment or dorm room. 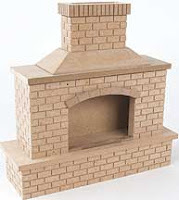 An outdoor fireplace made of MDF that could be an interesting addition to a kitchen or outdoor scene. I wish I could see the back of it to tell if it could be made double-sided. 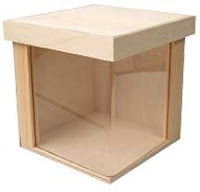 And a 1/2 scale corner roombox that reminds me of the small modern prefab kits used for extra living space. I *loved* Carnivale. The storyline and characters were so original, it really was an amazing series. . . If you haven't read the "Coraline" book by Neil Gaiman, I would recommend it. I'm really excited to see how the imaginary world is brought to life - the still shots look fantastic! Nip/Tuck and Burn Notice...I love them both. It would be cool to have a mini Christian lurking in my dollhouse. Yeah, he cracks me up. He has some one liners that make me laugh. I remember when that actor was on Charmed. If there was a Christian figure, then I would have to produce several "Bimbo" packs of women for him to randomly bed. ha ha!